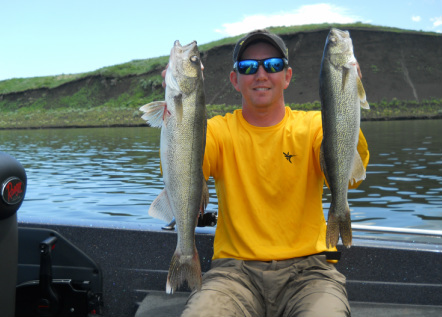 Eric (US Approved Coast Guard Captain) with a couple of dandy Lake Oahe Walleyes! Dakota Prairie Angling LLC provides action packed open water guided fishing trips on the Missouri River (Lake Oahe) and winter ice-fishing trips on northeastern South Dakota lakes. We have grown along with the rising water and have witnessed the fine South Dakota fishing explode!! Whether it's an open water or an ice fishing experience that you are looking for, a memorable experience is our goal. A low stress, relaxed day on the water with many tight-lines is what we strive for. Summer headquarters are Whitlocks Bay (west of Gettysburg, SD on HWY 212) on beautiful Lake Oahe. Dakota Prairie Angling is an experienced and professional guide service that will strive to put together what ever kind of fishing adventure you are looking for. Whether you are looking at taking kids fishing or are just a group of buddies, we are able accommodate people of all ages and groups of all sizes. Are you looking for a action packed walleye trip on Lake Oahe with multiple species or a perch jerking day on the ice? We will get you on the fish! Wanting to learn new techniques or about the latest fishing equipment available in the industry? Want to know where fish are in the Lake Oahe system at a certain time of year? Want to experience some of South Dakota's winter perch fishing? Contact us and we will do our best to give you a memorable fishing experience!!! FISHING ISN'T JUST PART OF OUR LIFE...............IT'S OUR PASSION!!! Guide Marlo with a Proud Angler Lake Oahe smallmouth bass! Young angler with his biggest walleye to date guided by Eric on Lake Oahe! !